I am not a morning person. It doesn’t matter whether it is Monday morning, or Saturday morning, getting me out of bed is never a fun task (both my mother and ex-boyfriends can attest to this!). I generally get up, showered, dressed and walk out the door without sitting down to eat any breakfast. But as we all know, breakfast is the most important meal of the day. So here is my handy solution for breakfast on the go. 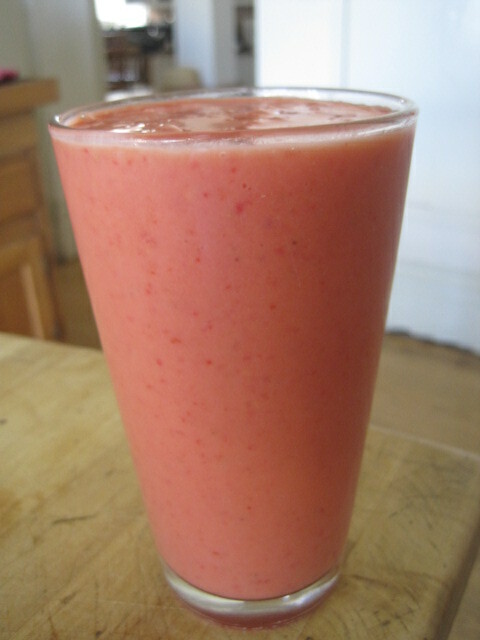 Place mango, strawberries, juice, banana, and yoghurt in a blender. Blitz until smooth. I usually pour my smoothie straight into a to-go cup so I can head out to door. Usually I put a handful of frozen blueberries in my smoothie as well, but I didn’t have any this morning. My solution to always having fruit ready to go is to put everything in the freezer. I purchased some fresh, organic strawberries from my local veggie store on Saturday, rinsed and sliced them, then popped them in the freezer. I usually do the same with my blueberries [mental note to self: buy blueberries]. I find that having all the fruit frozen gives the smoothie a better consistency than if it is fresh. You will just need to make sure your blender can handle it! I like using pink grapefruit juice a) because I am obsessed with it – in smoothies, in mimosa’s, with vodka – and b) because it adds a certain tartness to the smoothie which makes it feel extra healthy. If you are not a grapefruit fan, you can use apple or orange juice instead. If I have run out of bananas (or if you just don’t like them) you can leave it out, and just add a little more yoghurt. For a more filling breakfast, I usually pair my smoothie with a granola bar such as Nature Valley Oats ‘N Honey. Oh, I do love a luscious, protein-packed smoothie to start me off right. This looks terrific! Thanks Cara! It was definitely a good start to my week!